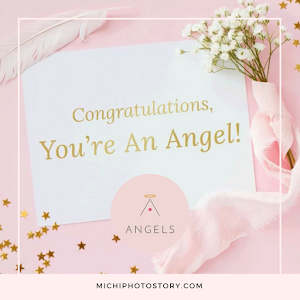 I can’t believe it’s already February, since Sunday we're so busy packing and unpacking stuff for my husband’s Baguio trip, Subic trip, and our upcoming trip. Very stressful week but finally we will be out again. Though I’m a bit nervous because we (my son and I) have to commute to meet my hubby (who is coming from Subic) before going to the airport. Good luck to me and my son, it’s been four years already since I rode a bus (bus from our place) so I still asked my former officemate a.k.a busmate regarding bus schedules and bus stop over. Good thing I’ve asked, iba na pala. This is one of the disadvantages of living outside metro manila, there is no taxi. This will be the start of my busy days, I love February month. Hoping for good weather. We left early because I do not want to miss the bus, so we rode tricycle and jeep to reach the last bus stop over. Thank God, we did not miss the bus, buzzer beater nga lang. It took us only 1 hour to reach our meeting place but hubby wasn’t there yet, we waited for 1 hour and 30 minutes before hubby arrived. When we reached the airport, the security guard said no more parking slot and he asked for our flight schedule. Naawa naman si manong and he said, “sundan niyo, try ko maghanap bandang dulo,” We only have less than two hours so we’re so scared to miss our flight. Thank God again because we’ve found one available slot. 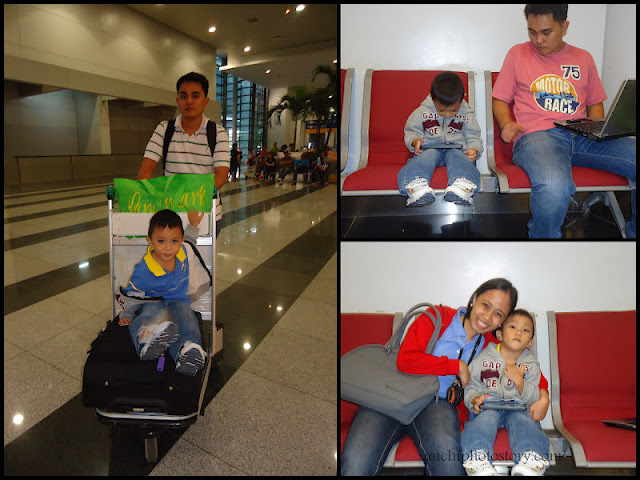 At the boarding gate, my son was busy with his tablet while my hubby was still working, trying to finish his report and I’m busy calling my sister, buzzer beater sa check-in counter. 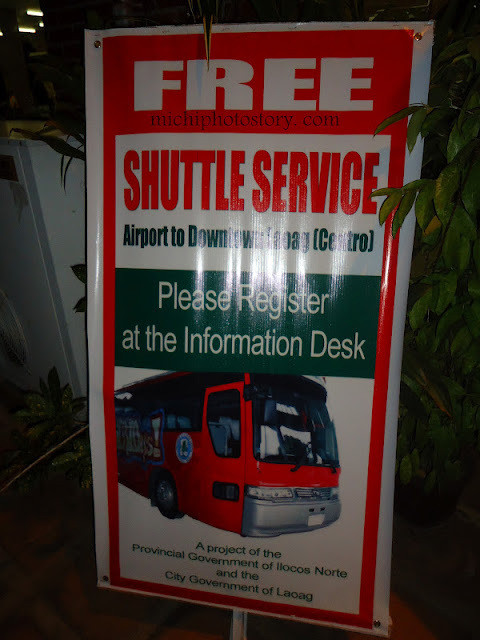 After one hour, we reached Laoag International Airport, I saw this poster so just in case you need a ride to Centro, you can take advantage of this free shuttle ride. I haven’t tried this because we have airport transfers. We stayed in UKL Ever Hotel, I chose this hotel because of price and location. 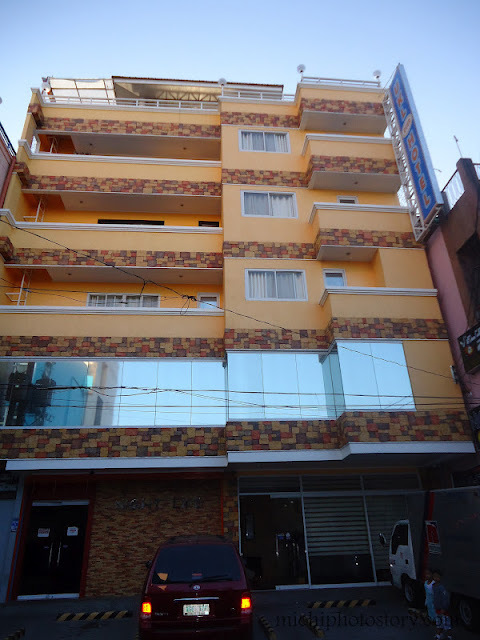 Fifteen to 20 minutes away from the airport and walking distance to market, fast food and tourist spots. Basic room and bathroom, ang ayaw ko lang ang taas ng heater, hindi ko abot ang knob. The room package includes free breakfast for 2. . The last time I was in Laoag was 12 years ago. I love the place. 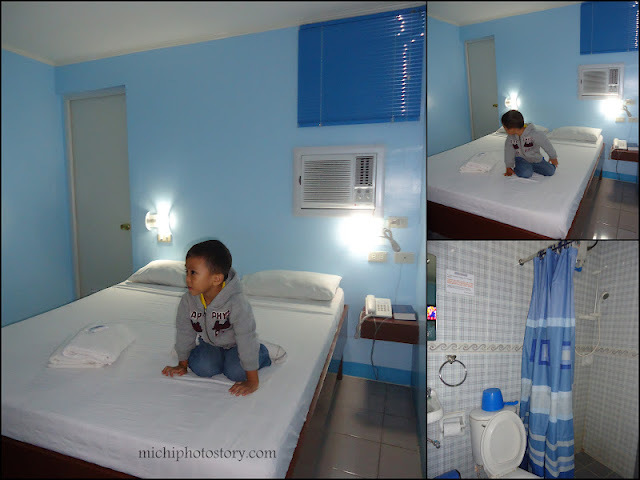 hehe cute ng room parang blue as the sky! I really miss this place. Ilocos Norte is part of my childhood because I used to live there. mrs. A - i love the place too. ganda! I haven't been to Laoag. That's one of the places in my list. naks may free shuttle na to centro. ayos! chyng - scary talaga, hindi ko alam kung ano gagawin kung wala talaga slot. P800 for standard room. We don't have any bad experience with UKL so I would recommend this. 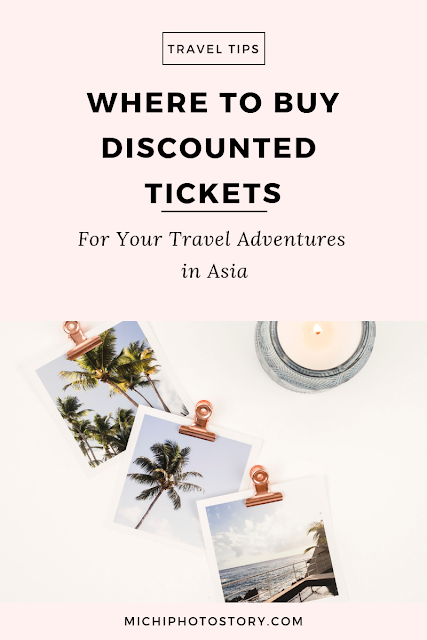 Been to Laoag lately.. arghh.. sa Texicano kami napunta 875 pero pangit sana pala dito na lang kami.. sayang.. nabrowse ko pa naman tong blog mo when I'm researching for a hotel in Laoag.